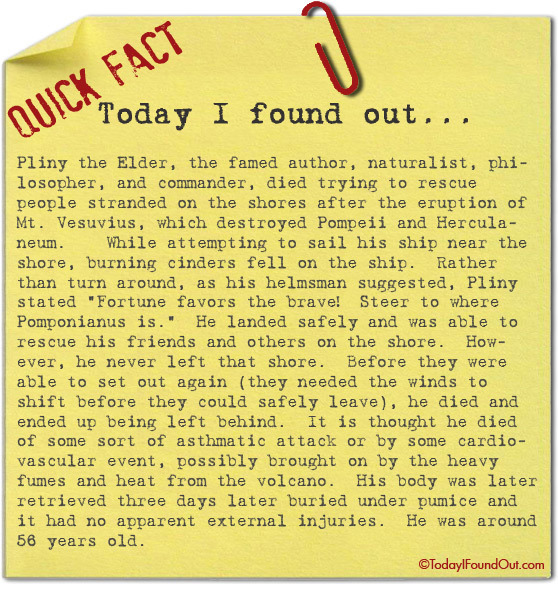 Pliny the Elder, the famed author, naturalist, philosopher, and commander, died trying to rescue people stranded on the shores after the eruption of Mt. Vesuvius, which destroyed Pompeii and Herculaneum. While attempting to sail his ship near the shore, burning cinders fell on the ship. Rather than turn around, as his helmsman suggested, Pliny stated “Fortune favors the brave! Steer to where Pomponianus is.” He landed safely and was able to rescue his friends and others on the shore. However, he never left that shore. Before they were able to set out again (they needed the winds to shift before they could safely leave), he died and ended up being left behind. It is thought he died of some sort of asthmatic attack or by some cardiovascular event, possibly brought on by the heavy fumes and heat from the volcano. His body was later retrieved three days later buried under pumice and it had no apparent external injuries. He was around 56 years old. Some years late, but there was in fact a Pliny the Younger – the nephew of Pliny the Elder, rather well known for his epistolary writing.